GB TEAM ALSO FINISH IN BRONZE MEDAL POSITION. 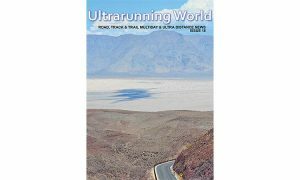 Emily Gelder (Dulwich Runners) ran probably the best race of her life to take a superb bronze medal, in the 2012 IAU World 24 Hour championships in Katowice, Poland at the weekend. Her final distance was 238.875 km (148miles 757yards), a huge improvement on her previous best. En route she set, subject to ratification, a new Welsh best performance for 100miles of 15 hours 15min 29 secs. The race was won by Michaela Dimitriadu from the Czech Republic with a distance of 244.232 km (151.75 miles) with Connie Gardner (240.385km 149.36miles) USA in second. Scots, Debbie Consani in 14th with 217.180km(134miles 1671 yards) and Sharon Law in 20th (210.404km 130miles1300yds),both Garscube Harriers, set personal bests as the British girls claimed the Bronze medals in the world team competition behind USA and France. 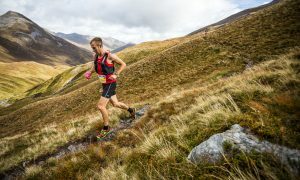 Consani set new Scottish figures for the intermediate 100 mile distance of 15:48:18 and 200km 20:55:35. In the concurrent European championships, Gelder claimed the individual silver medal and the GB squad the team silver medals. 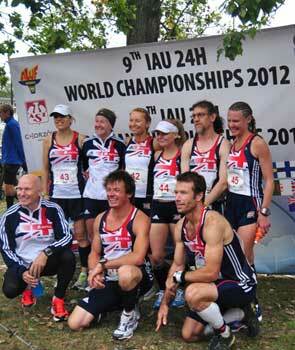 The other British ladies in the team, Karen Hathaway and Jen Salter recorded 179.95 km and145.217 km respectively. In the men’s race GB athletes Pat Robbins joined an illustrious group of British men to break through the 150mile barrier. He finished in 13th place with a distance of 246.071km (152miles 1586 yds). 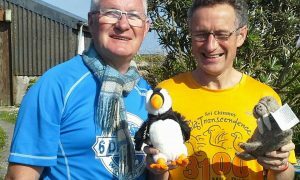 Steve Holyoak just missed the 150 mile mark but still recorded a PB when finishing in 21st place with 240.377 km (149miles481 yds). Chris Carver, had a solid run with 231.339km (143miles 1318yds). Commonwealth 24 hour champion John Pares had a difficult race but still accumulated 180km (112miles 1671 yds). Report from Adrian Stott part of the team management in Katowice.